APOSS 10th Results will be declared on 31st May 2014. 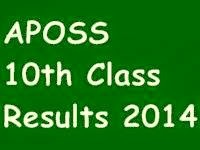 APOSS 10th Class Results (APOSS SSC Result 2014) will be available in the official website http://www.apopenschool.org. Every year APOSS (AP Open School Society) conducts 10th Class written examinations in the month of April. Lot of candidates have appeared for this APOSS SSC 2014 Exams. About 84,672 candidates have appeared for APOSS 10th Class Examinations in this year, they can check their result in the official website by submitting their hall ticket number.